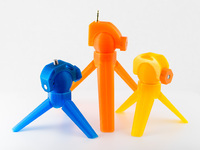 FLIR Boson camera tripod holder by Ghiadriver is licensed under the Creative Commons - Public Domain Dedication license. This is a snap on holder for a FLIR Boson thermal camera to mount to a tripod. there is a heagonal indent to take a 1/4 20 nut that is the standard thread for tripods. Say thanks by giving Ghiadriver a tip and help them continue to share amazing Things with the Thingiverse community. We're sure Ghiadriver would love a Tip, but unfortunately they have not setup their accounts to receive them yet.